The Corolla Wild Horses have graced our beloved shores since the first Europeans landed in the 1500s. Arriving with the initial Spanish explorations in an area believed to be near present-day Sandbridge, VA, the horses were pushed off the boat – possibly to lighten the vessels for better flotation — and then subsequently abandoned when the explorers met strong resistance from local natives. The resulting hasty retreat by the explorers forced them to leave their livestock and horses behind. You can just imagine how hard it would have been to get these animals back onto their boat with arrows whizzing by their heads! Traced though DNA research, the Corolla Wild Horses’ lineage has been determined to be from these original hardy Spanish Mustangs. Though the horses thrived for close to 400 years in this largely undisturbed area, once development boomed in Corolla during the 1980s and ‘90s, the herd was eventually threatened to almost extinction. Their numbers fell to as low as 40 animals from rampant inbreeding, consumption of indigestible foods and being struck by vehicular traffic. Fortunately, the herd was moved north beyond the paved roads from Corolla to Carova Beach in the mid-90s, and their numbers presently have risen to more than 100 strong. But development once again is encroaching on these magnificent creatures, and habitat closures from outdated Bureau of Land Management policy now threaten to restrict the herd to 60, thus causing more inbreeding. Thanks to legislation suggested by students at Shawboro Elementary School in Currituck County, the Corolla Wild Horses were officially designated the “State Horse of North Carolina” in 2010. But there’s still much work to be done to secure federal protection, preserving these national treasures in posterity. 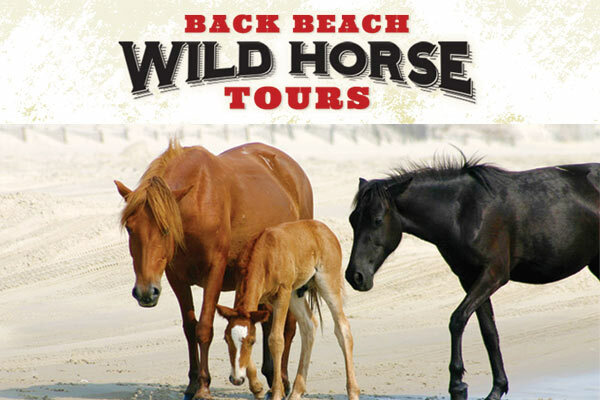 Please learn what you can do to join our ranks as a proud Supporter and Partner of concerned citizens overseeing the majestic herd at Corolla Wild Horse Fund.